Like previous reviews, I am no longer porting out to my hardware Dyna-mites. Softube/UAD got it just right. It is so simple and intuitive to make Dyna-mites point up weak dynamics or level out the overly peaky. In addition, I used it to separate the kick and snare out of an all in one drum track from a band's club date. Just like the hardware unit can. I've actually recorded and mixed with most of the compressors UA makes plug-in versions of and happily use theirs instead of the real things (because they sound that good). But I've never used the Valley People Dyna-mite and God, what a sound I've been missing out on. This thing does for drums what nothing else they offer can. Kick, snare and toms pop in a way I just can't get with an 1176 (my previous go-to for that task). The attack of the drums are brought front and center and the extraneous noises stay in the background. Not pumping and breathing - popping and receding. Just awesome. The best thing for getting lame drums to explode!! And the gate works really well too. This is truly a marvelous compressor. I have tried it, and loved it, on everything except vocals. I’ll be taking the final plunge and strapping the Dyna-mite across my vocal today. This compressor is a diverse and truly useful tool for my arsenal. Nothing but fun! I love using the Dyna-mite compressor on my Clavinet parts it really helps bring out the attack. The sound I get "pops" out and lets you hear the groove with the bass player. 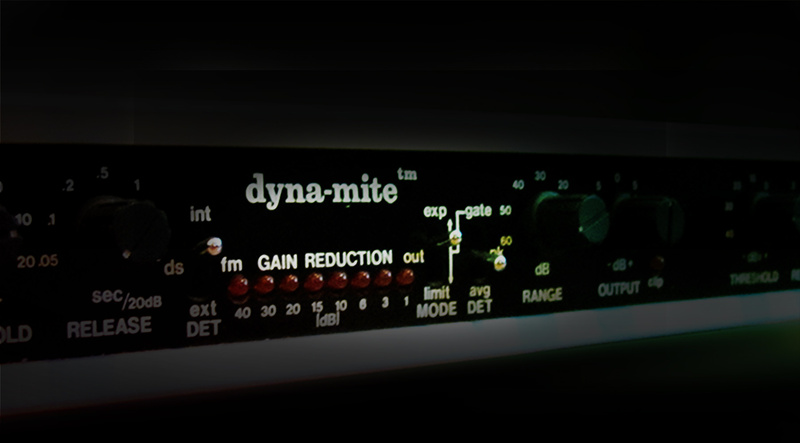 As i´m mostly doing narration, the Dyna-mite does a wonderful job as a gate/expander. Works really great and sounds very natural. It captures that late 70s LA sound I always liked. Works on el pno and gtr too. I allways use the Valley People Dyna-mite Plugin on drums. I get very clear an punchy Drums when i use it on the single channels but i use it also on the drum bus to get it glued together. It is also nice on the bass guitar and mix busses. I've used it on drum tracks, I've used it on vocal tracks. Another great UA plug-in. This dynamic tool is my secret weapon for any kind of extreme and obvious compression/limiting. Really great!!! UAD makes a lot of great plugins. This one was like finding a Pearl of Great Price. This adds tremendous life and control to nearly everything thrown at it. DSP memory friendly, too. It shoves to the forefront or buries in the background; controls transients and or finds them if they are missing. Excellent job, folks! This hidden jem has found an appreciative audience. Thank You! I came across this guy when looking for some aggressive drum parallel compression. Wow. Took about 30 seconds for me to go buy it. A sound all it’s own for sure. Doing voice over work in a less than perfect environment made me seek a good noise gate. Tried so many,both hardware and software.....then at George Whittam's urging,and after discovering a UAD coupon,went ahead and got the Dynamite. Just the ticket! The gate works great.......and I haven't even tried the other features....they will be the GRAVY! Of course you can use it like a traditional compressor , as good as others are , but you can try such differents and unexpected things with this magical tool ! A great idea to have made a plug-in of this nice hardware ! for Drums the dynamite is my go for it tool. But I like him too on clean E-Guitars especially when the guitars were tracking on DI mode to domesticate the attacks. Give the Dynamite a chance and try it with difference applications and you know what I mean ! Awesome drum parallel smash track. Makes the drums sound huge. Great for crushing rooms when they aren't as exciting as they should be. Valley people dynamite compressor is dynamite. This dynamic processor is so smooth it is incredible. I have used it hundreds of times on many different tracks and it works absolutely great. It is very very quiet and does a Number of different jobs as it was designed to. I have used the Valley People Dyn-a-mite in hardware studios that do you not have plug-ins and this performs and sounds just like the those, it Uses very little DSP. I can put it in many tracks if needed, as I want. If you don't have it ..., ....you better get it.